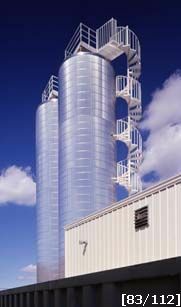 This multi level stairway reaches approximately 56’ high to the top of a storage silo. The stair is 60"diameter with 30 degree treads and several 60 degree rest landings. The handrail is # 200 (1 1/2" round) tubing; balusters are a # 302 (1" square) tubing, two per tread; treads are a # 112 (3/16" thick) checker plate steel. At every 1 1/2 turn of the stair is a rest landing with a guard rail 42" high from the floor to the top of the guardrail. The landing at the top is a 90 degree square with handrails on two sides. The center column is a 3 1/2" ID round schedule 80 pipe. The stair was fabricated in one section and spliced into four sections for shipping. The sections were reassembled and welded together adding lateral supports from the stair to the tower for extra support. The stair was shipped with a prime coat, and final paint coat was applied at the job site.